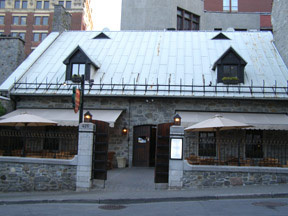 Stonewalls, antiques, and wood burning fireplaces, add to the charming and romantic ambience at Auberge Le Saint-Gabriel in Montréal, Canada, which has the distinction of being the oldest inn in North America (1754) and was the first to receive an alcohol license granted from the British. Add a dash of history and a few tales of ghosts to Executive Chef Jean-Marc Mathieu's French and Québécois menu and you have a recipe for success. When the sign reads since 1754, there is a certain level of expectation that one has, and upon entering the Auberge Le Saint-Gabriel with its rough stonewalls, bubbling waterfall, antiques, and welcoming staff, the stage was set for an enjoyable evening. Edward F. Nesta and I had dinner at the Auberge Le Saint-Gabriel during a trip to Montréal, Canada in May 2009, and although the name on the sign outside is Auberge (Inn) Le Saint-Gabriel, the inn has closed, leaving the restaurant to carry on its long tradition of hospitality. The restaurant is enormous, with pockets of interesting and cozy spaces to dine on multiple levels, with separate bars located throughout. We dined in the part of the Auberge that was the former stable, sitting at a square wood table with wood and black leather chairs by the deep recessed stone windowsill. Although it was May, there was still a slight chill in the air and a fire burned brightly on the opposite side of the room with an ample supply of stacked wood nearby, and a long bar where we watched the barmen in action. Rough stonewalls, slate floor, wood-beamed ceiling with black chandeliers dressed with square shades, candles on the tables dressed with placemats and white linen napkins, and antiques throughout completed the ambience. 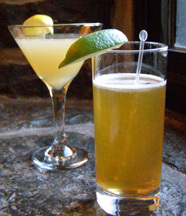 Since Le Saint-Gabriel received the first alcohol license in Canada, we had to honor its long history and tradition and toast to its success with two of their creative cocktails, the house signature, the St-Gabriel made with vodka, grapefruit juice, maple syrup, lemon juice, and garnished with a lemon wedge, and one of their new cocktails, the Vaudoo, which is French for the word Voodoo, made with amber rhum, Martini Rouge, apple juice, lime juice, cane syrup, and garnished with a lime wedge. As we looked over the menu, a mix of traditional and modern French recipes, Chef Jean-Marc Mathieu began our dining experience by sending Edward a Pork Terrine and Sliced Smoked Duck to sample, which he would be introducing on his new menu. 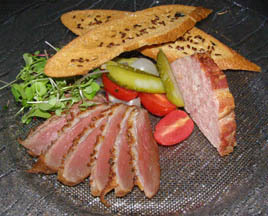 Presented on a round glass plate with a slice of terrine, six slices of duck with a delectable crust, and accompanied with mesclun, grape tomato halves, cornichons, tiny cocktail onions, and two crisp flax seed toasts, this was a hearty meal in itself. 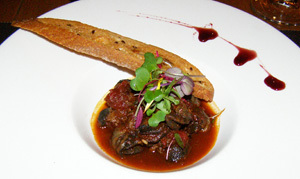 Edward continued with Escargots Provençale with licorice flavor (Escargots Provençale parfum de réglisse) presented in a large round bowl with a small deep indention filled with the snails in a tomato base and garnished with baby herbs, a crisp toast spear, and three flavor tears on the edge of the plate. I selected the Black Tiger Shrimp with Chipolte Pepper and Crisp Vegetables (Crevettes "Black Tiger" piment chipolte, légumes croquants) from the Traditional and Modern Table d'hôte menu (Entre Tradition et Modernité/Table d'hôte menu). Presented on a rectangular art glass with three recesses, four glazed and spicy shrimp captured the eye as well as the palate with raw zucchini fans, daikon sprouts, long spiraling curls of carrots and beets, and raw carrot flowers, this was a lovely course, complemented by a 2007 Chardonnay Del Veneta, 12.5 % alcohol, Campagnola, Italy, which also accompanied the escargots. The restaurant has an excellent wine menu as well as offers a good selection of wines by the glass, and since Edward and I were going separate routes for dinner, we decided to experience wines by the glass, rather than by the bottle, to complement the diversity of our courses. For his main course, Edward had Roasted Seabass and Pork Belly Glazed with Red Wine Mascarpone Risotto with Fresh Tomatoes (Bar Méditérannean, flanc de porc glace au vin rouge, risotto au mascarpone et tomates fraíches), which Fréderic our server paired with a 2006 Nicolas Potel, "Maison Dieu" Bourgogne, Pinot Noir, 13% alcohol, from Nuits-St-George, France. 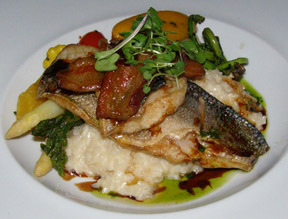 This course was presented on a deep round white plate with the crispy-skinned seabass topped with the pork belly and garnished with baby herbs, resting on a bed of the creamy risotto with a nice selection of vegetables that included patty pan squashes, white and asparagus, fiddleheads, and yellow pepper. I continued with Roasted Salmon with Coconut Milk, Mint, and Lemongrass (Saumon rôti, lait de coco, menthe, citronnelle), also from the Tradition and Modern Table d'hôte menu, which was paired with a Québec wine, a 2007 Les Pervenches, Seyval-Chardonnay. 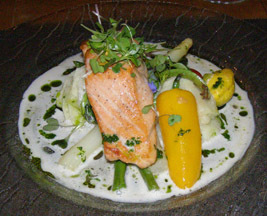 This course was presented on a round art glass plate with the salmon garnished with baby herbs and resting on bed of patty pan squashes, white and green asparagus, mashed potatoes, cherry tomatoes, yellow beets, bright yellow pepper, and one of my springtime favorites, fiddleheads (which are the furled buds of ferns), with a complementing pool of white sauce accented with green herb oil droplets. Edward loves lemon desserts, and when he saw the Saint-Gabriel style Lemon Tarte (Tarte au Citron - façon Saint-Gabriel) he looked no further on the menu. 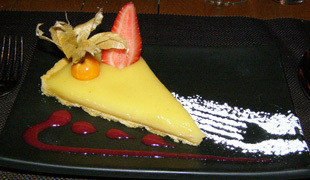 Unlike many lemon pies that arrive weighted down under a blanket of meringue, the Saint-Gabriel style Lemon Tarte arrived naked, that is without meringue, and was simply garnished with a Cape gooseberry (physalis) and a sliced strawberry, with a confectionary sugar fork outline on the black rectangular plate with berry coulis dots of flavor. The result was that the lemon was the first experience on the palate, and that was enough with its perfect balance between tart and sweet. The Québec region is famous for its maple syrup so when it came time to select my dessert, I knew that I had to experience the traditional Québécois Sugar Pie (Tarte au Sucre) made with a delectable blend of maple syrup and cream. 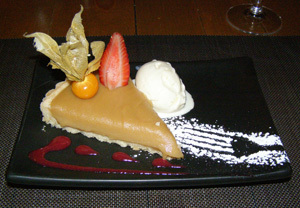 The sugar tarte arrived on a black rectangular plate garnished with a Cape gooseberry (physalis) and a sliced strawberry, with creamy vanilla ice cream, and a confectionary sugar fork outline on the plate and berry coulis dots. One bite assured me that I had indeed made the right decision; it was perfect, just sweet enough, yet not overly sweet or cloying. Fréderic paired our desserts with Neige Cider de Glace (Ice Cider), 12% alcohol, which is also a famous product of Québec, and it was a wonderful way to end the evening. 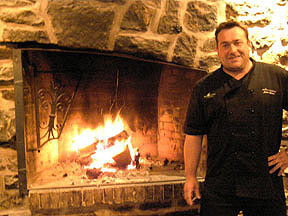 Auberge Le Saint-Gabriel is open for lunch Tuesday - Friday from 12:00 pm - 2:30 pm, and for dinner Tuesday - Saturday from 6:00 pm - 10:00 pm. 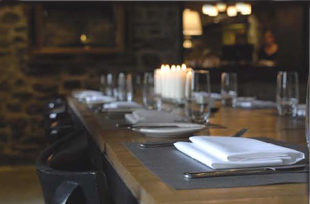 Read about Auberge Le Saint-Gabriel in the Chefs' Recipes section where Executive Chef Jean-Marc Mathieu shares a traditional taste of the Québec region in English and in French.